Poor John and the almighty cheap haircut | Where to next? Poor John is obsessed with getting cheap haircuts—not so much so that he’ll let me cut his hair, but obsessed nevertheless. He happily recalls many $2 haircuts on our travels throughout Africa. In Nigeria there was a difference between barbing and barbering. Barbing was done with clippers only (or so Poor John surmises) and barbering throws in a bit of scissor work. He stuck with the barbing only—no sense overspending on a haircut. He was also pretty pleased with a $4 haircut (plus a $1 tip I made him give) at the hairdressing school in Denver Colorado. The equivalent school at the Canberra Institute of Technology charges about $12. It was closed during the Easter holidays so Poor John decided to let his hair grow until he made it to China and another land of cheap haircuts—don’t mention the time he got gouged in western China. So we’re back in China. We landed in Beijing about 5:30am on Friday. Within four hours we had checked into the hotel, had showers and were on our way to see—you guessed it—a barber. Of course, we weren’t looking for any particular barber, just any old barber who could/would do the job on the cheap. Any sign that said ‘unisex’ and any hairdresser wearing chains or high heels were to be avoided. Sequins were out and so was silver trim. I spotted the black-and-white, checked barber poles first. Poor John hadn’t even noticed them, but I suppose he was looking for the standard red and white striped poles you see in most of the world. 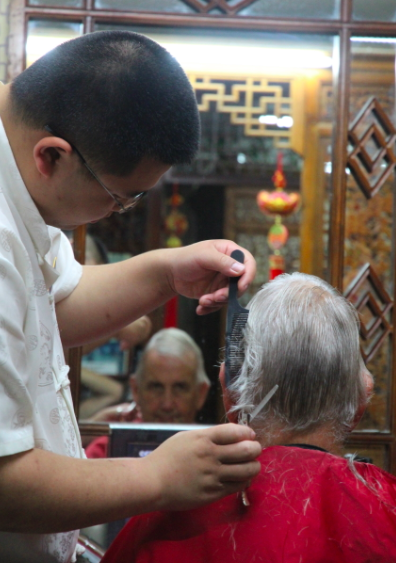 Using a bit of sign language and a note pad, the receptionist explained that he had a choice of a 40, 60 or 100-yuan haircut. Not surprisingly, Poor John thought 40 yuan would do the trick, so we sat down to wait for his turn. Well what a palatial joint. 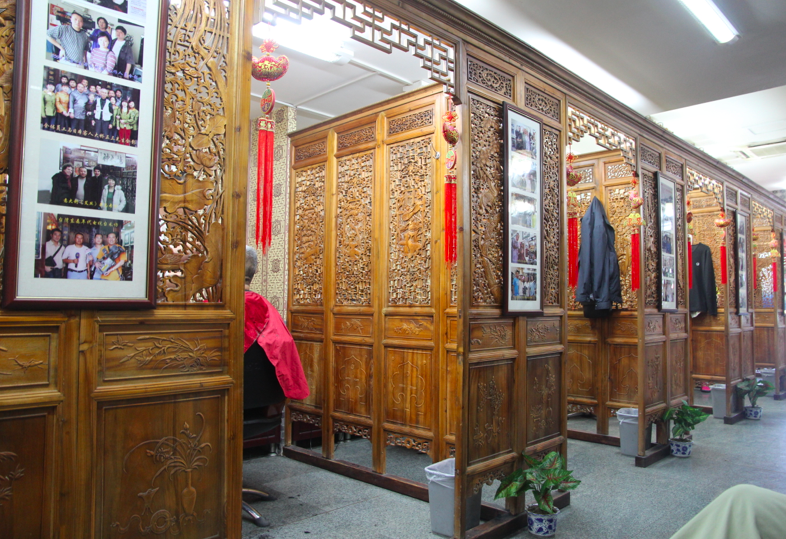 Each barber had his own ornately carved and well-equipped cubicle. The sixth and last cubicle was quite a bit larger than the others and was probably where he-who-commands-100-yuan-per-haircut operated. He was, indeed, laboring away—hair by hair—on a fellow’s meticulous crew cut. What a production. But that wasn’t Poor John’s barber. No, that fellow was in the middle of someone else’s cut when we arrived so after we sat down, the receptionist brought us two cups of refreshing green tea. Soon enough it was Poor John’s turn and his 40-yuan cut was done with care and attention. He even got his hair washed—twice. He reckons this will hold him until we are back in China towards the end of July. I suggested that, as 40 yuan is less than $7, he might spring for another cut in between, somewhere in the Stans. He’s thinking about it. Funnily enough I have just had one, looks fine from where I am 🙂 No idea what others think of it though, the best part is if you make a mistake, it will grow back and I can do a better job next time. The barbers here have a red and white pole, I never took much notice until you pointed it out. You must be looking all spruced up. Sometimes barber poles are red, white and blue, but I read that no one knows exactly where the blue comes from. What – no before and after pics? Oops, sorry! But you know what he looks like before and after. Methinks you spend most of your grooming money on your cats. Nothing wrong with that, but I don’t think Poor John could stand to wait six months between haircuts. This article was especially fun and I am sharing it with Brian as he always enjoys haircuts in exotic places. Looking smart John. My two — poor Graham and young Luke — aren’t so much keen to get a cheap haircut as too lazy to head out to the barber — when they consider they can get a free cut in the garden or watching the telly from me! Have been doing it for years. Very nice, Peggy! I’d forgotten John went to the barber school here for the $4 haircut! My best cheap cut was in Thailand where they also had individual private cubicles though very plain especially when compared to this one! Nevertheless they were private cubicles with a closed coor even. The $4 (about, certainly not much more) included the washing, cutting, nose trim, eyebrow trim, ear trim and neck & shoulder massage at the en! Awesome treatment and if I remember right I went ahead and gave him about a 100% tip as I was so pleased. Keep those good cheap haircuts coming! He’s not ready yet for his next cut and is trying to work out in which country to have it. Sorry Louise, but I completely missed getting one. John would love Nepal’s 50 rupee (31pence) haircuts. Our nephew Kumar pays half that in the nearby police barracks. Peggy, John might not like the barber shops here. They are primitive and filthy mostly. There are much better places in the capital but prices multiply in those. You are welcome. In the nearby APF barracks, they charge only 25 Nepalese rupees which is half price so it’s almost worth coming to Nepal for. There sre some cheating barbers down in the city who rip off unsuspecting tourists for 400 rupees and I went to one once who demanded 400 rupees. I just threw a 100 rupee not on the counter and walked out leaving him protesting. I usually leave 100 rupees which is 50 rupees for the haircut and a 50 rupee tip. My Nepali friends cringe at this but I am well pleased. I agree with you. At that price a huge tip is mandatory. We also know about tourist-cheating barber. 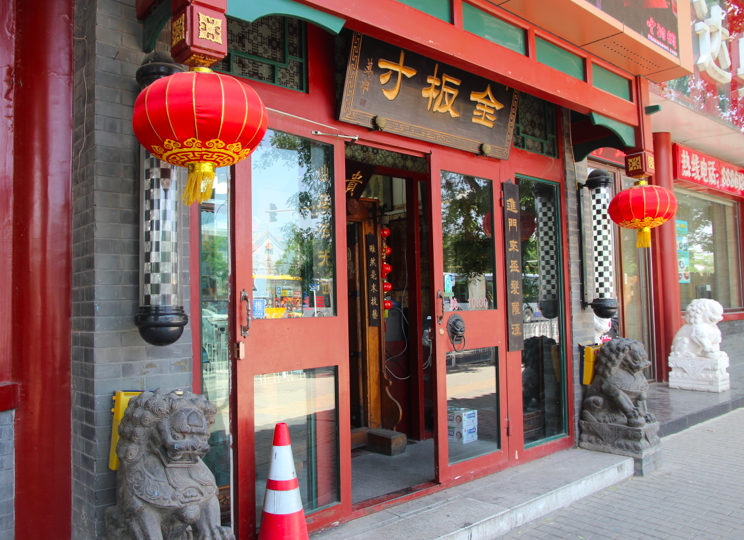 Encountered one in Kashgar in China. I could live in one of these stalls! I totally understand the benefits of waiting for such an experience. Poor John is definitely a Kindred Spirit! Those stalls were so elaborate, I can see how you be tempted to move in. Hilarious story of hair cutting 😀 Now I am thinking to have Chinese hair cut. 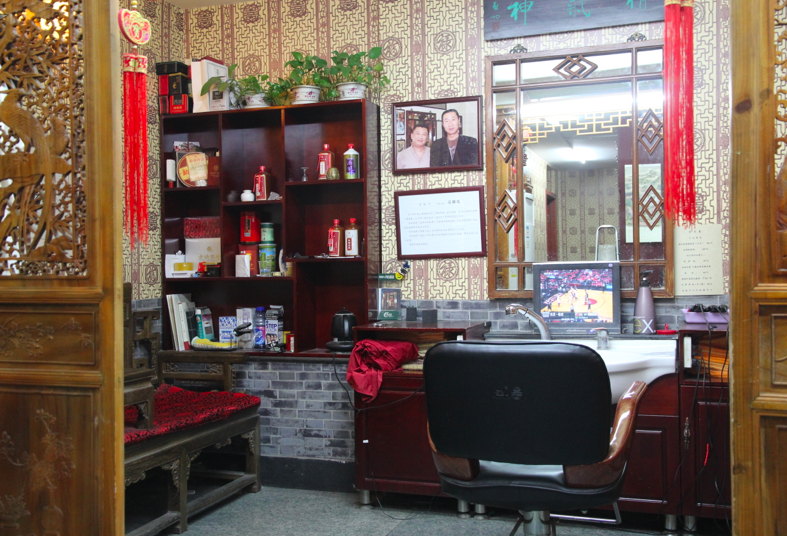 Not bad at all :D.
I don’t know if all Chinese barber shops are so grand, but this one was amazing. The guy at the back (the biggest stall) was doing fancy haircuts.